In a Friday statement, the Islamist party called on the General National Congress (GNC) to call early election "to widen the scope of national consensus and maintain social peace". TRIPOLI - The Justice and Construction Party, Libya's second largest party, has called for early election in the crisis-stricken country. The party underlined the need to protect "the democratic path, peaceful power rotation and freedom of expression". "We seek to create political consensus inside and outside the GNC," leading party member Bayan al-Hurizy told Anadolu Agency. 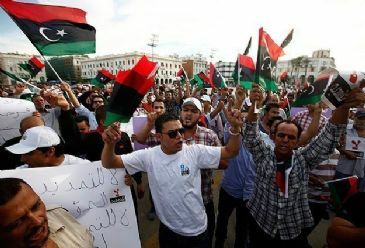 Hundreds of Libyans demonstrated last week in the eastern city of Benghazi to protest the GNC's extended mandate. The protests came in response to calls by the 'No to Extension' campaign, launched last December after the GNC voted to extend its mandate by one year. The GNC also extended by one year the country's transitional period, which followed the fall of Muammar Gaddafi in late 2011. Under an original timetable for transition, parliament should have elected a constituent assembly, drafted a constitution, and put the draft charter to a popular referendum before holding parliamentary polls sometime before February. The new GNC-endorsed timetable, however, stipulates that a constituent assembly be elected by February and a new constitution drafted by July, to be put to a vote by August. Parliamentary elections should be held by December, according to the new timeline. The twin extensions have been met by anger on the part of many Libyans, who have called for protests aimed at pressuring parliament to reverse the move.